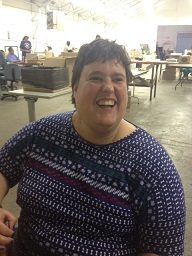 Erin is an energetic woman who works at DSC as a materials handler. She expressed how happy she is to work there; however, she would like the opportunity to work as a receptionist at the Sheriff's office someday. She explained that the job looks interesting and that she already knows the Sherriff and the secretary! Erin is very active with Special Olympics. She participates in Bocce Ball, Bowling, and Track and Field. She stated that she recently attended the Family Fun Festival with her family and had a wonderful time. Some of the places she likes to go out to eat is Dairy Queen and Arby’s. She also likes to stop by the Savoy Goodrich Theater to see a funny movie from time to time. Erin noted that she loves to laugh, and that is why she prefers comedies over everything else. When she is not out in the community, she spends a lot of time with her six year old niece. She stated that they play a lot of games together. Erin also likes to relax by watching television shows such as The Price is Right, The Brady Bunch, and I Love Lucy. She said that she loves country music and listens to WIXY100.3 quite often. Thanks for sharing with us, Erin! We enjoyed getting to know you!